‘To build or not to build?’ is more often than not a rather profound, mind-wracking, heart-churning, soul-searching question, be it for a young couple or a growing congregation, a thriving corporation or even an emerging country! Apart from the economic prudence and social justice angles, from a purely missiological lens I shuddered we may be treading the undesirable path of so-called ‘post-Christian’ Europe, ending up 100 years from now with beautiful but empty cathedrals only good for tourism or sale to condo developers, effigies of a dying spirituality. Oh yeah, and there is the splendid basilica in Yamoussoukro next door, Notre Dame de la Paix, which I got to visit a couple of times during my one-year sojourn in Cote d’Ivoire as a United Nations peacekeeper. The grandeur of the edifice from afar and the sense of awe it evokes in the soul upon standing on those holy grounds left me schizophrenic how a nation with such a holy habitation would be at war or why this multi-million dollar erection is queerly perched in the middle of poverty and even backwardness. Apparently the papacy—John Paul II was the pope at the time—before agreeing to the 1990 commissioning of this expensive edifice in the midst of pauperism insisted that he would do this only on condition that a hospital be built in the vicinity of the cathedral (sort of to ease his conscience, I guess). As far as I know, then-president Félix Houphouët-Boigny acquiesced and that hospital was commissioned at that time but is still yet to be built, 28 years later! Part of my unease about hardware with no software, the case of Western civilization’s empty cathedrals but denying the power thereof, has been eased with the knowledge that this venture is a two-edged sword of both Cathedral-as-Infrastructure and Cathedral-as-Convenor. Those who say faith should have no place in the public space are ill-informed at best and naïve at worst. This is true and matters even in the West where the so-called post-Christian era has brought in its wake such a keen thrust towards secularism let alone in Africa where religion is life and life is religion, period. You can find loads of books and scholarly articles written about how culture and religion are inseparable in the African paradigm. The Cathedral seeks to facilitate conversations and critical public debates. There is one in the works, which I plan to attend, that has even garnered international interest. We have a lot to talk about, with so much faith and so little integrity, or so many churches but so much filth and poverty in Ghana. Then to act. In this vein, I congratulate the National Cathedral Secretariat for not falling prey to what Jim Collins calls, “‘the tyranny of the ‘or’” but fully riding on the wave of “the genius of the ‘and.’” Not Cathedral-as-Infrastructure or Cathedral-as-Convenor but both/and. For my worry that we may be building concrete structures rather than investing in the actual making disciples of Jesus Christ, I say to myself, it isn’t either/or; it can, and indeed should, be both/and. For Christians who say our body is the temple of God so we need no other such national cathedral, may I again submit, it’s not either/or but both/and. One of the most important things I have learnt about this project is that the government is only providing the land. None of the money for the proposed cathedral will be taxpayers’ money. The Christians who believe this will be honouring to their God are expected to put their money where their mouth is. That eases my concerns a bit, as a sort of secular state (that’s a fallacy; plus we should perhaps revise our stance on annually facilitating pilgrimages to Mecca on taxpayers’ money). There are enough Christians and more than enough Christian cash to put up this building. Between a mere two denominations, say the Church of Pentecost (have you seen their conference centre at Kasoa?) and Lighthouse Chapel alone (go and see their Anakazo edifice in my hometown, Mampong-Akuapem), this is easy-peasy.It will be great to see the unity of the body of Christ in Ghana around this one national vision and mission. As a budding missiologist, such a monument of the Christian faith is of much interest to me as a symbol of Christianity on a continent which only 100 years ago was considered ‘savage,’ ‘dark’, ‘primitive’ and ‘heathen.’ This year, 2018, is the first time in the history of the world, actually, that Africa has been billed as the continent with the most Christians in the world! Perhaps a national cathedral in Ghana, a major player in quantity and quality of Christianity on the continent, may be a worthy monument to mark this new era, to the glory of the God of Africa too. It seems like the only good time to build a national cathedral is after there is no poor person in Ghana, a perfect doctor-patient ratio, Malaria has been eradicated, everyone has a job or is in school… in other words after all our problems are solved. In that case, there will never be a good time to build a national cathedral then; not even a house of parliament or a national sports stadium. This issue can really be a chicken-or-egg-which-comes-first one. Do we prosper first and then honour God with a national cathedral or do we honour God with one first and prosperity ensues. In the context of Haggai, God has no doubt which comes first: “You expected much, but see, it turned out to be little. What you brought home, I blew away. Why?” declares the Lord Almighty. “Because of my house, which remains a ruin, while each of you is busy with your own house.”I will suggest you read the whole chapter here. We may be saying that when all is well with us we will build a national cathedral for God’s glory; he might be saying, until you build me a national cathedral for my pleasure, honour and glory nil will be well with you. Smack in line with the above argument against the national cathedral is the argument about poverty in Ghana. Poverty around is not an excuse for not giving God our best. That is the whole concept of the widow’s mite. That being said, we must put on record that nobody has done more work in alleviating poverty, building hospitals and schools like the Church (Body of Christ) in Ghana. The Church has done enough for society to be worthy of a single ecumenical cathedral at her own cost! Aaba! Even then, this is not just a monument but a practical, functioning construction for the use of the State! It will be interesting to research how much the Church has contributed against how much even government itself has done in bringing dignity to the lives of Ghanaians. If I may be permitted to be so crass I would dare say that perhaps the Church deserves a national cathedral even more than the government deserves a Jubilee House! Can the Church in Ghana do more? Sure! But even then the Body of Christ in this country has already done more than enough to bless Ghanaians of faith or no faith with education and healthcare, peace and prosperity, civics and commerce, ideas and industry, to deserve one national, non-denominational, inter-denominational edifice to the glory of this God of theirs! There was poverty in Ghana when we built Parliament House and the National Theatre and the Accra International Conference Centre and Jubilee House. “The poor you will always have with you.” We will come back to who said that and in what context shortly. That is not to say we be cursory or even fatalistic about poverty in our developing country and not do much about it; what is meant is that if we’re going to use poverty in society as a barometer, we will never build anything celebratory or symbolic except hospitals, schools, roads, prisons and such. Also related to the above is the fact that many shouting, “this is extravagant, oh so unnecessary when we have the poor,” actually don’t care a hoot about the poor! Ghana’s woes stem from that same educated middle and upper class. They remind me of Jesus’ treasurer, Judas. If anybody loved and cared for the widow, orphan and poor it was Jesus. Yet on this one occasion when a woman with a past decided to pour her expensive jar of perfume on Jesus, he did not stop her. Everyone else thought this was a waste or rather extravagant at best (it was worth a whole year’s salary!) but Jesus thought it was the coolest thing ever—whole-hearted worship, giving God one’s very best. The ‘everyone’ included Judas Iscariot, who was audacious enough to open his big mouth to say this perfume could’ve been sold and the proceeds given to the poor. He said that because he was a thief and wanted to help himself to additional cash in the kitty, yes, but more importantly Jesus made it clear that there is a place for pure-motived, no holds barred, deep-felt extravagant worship even in the midst of poverty. It was in that context that Jesus shockingly revealed that “the poor you will always have with you.” After investing the equivalent of all the cathedral project money into poverty alleviation programmes as church and government have done for decades, we shall still have poor people in our midst. Leaders like to build—figuratively and literally, people and things, systems and structures. I have heard “The king’s heart is like a stream of water directed by the LORD; he guides it wherever he pleases” quoted in untoward circumstances when Christ followers want to see a heart-change of sorts of someone in power regarding some policy and such. But if the Christian God does direct the hearts of leaders of nations, could it be that it is he who has put this desire in the heart of the Ghanaian president? That desire to build for God was put in world leaders like Darius, Cyrus, Nehemiah, Solomon… dare I say Houphouët-Boigny? Could it be that this desire has been implanted into the heart of Ghana’s President by God himself? Inasmuch as I just spoke to the notion that a leader’s desire to do something great for God is a fact of life and of history it isn’t always acceptable to God because it might not be for them in particular to do and/or the timing may not be right in God’s scheme of things. The great Jewish king David loved God and once said to himself, “Here I am, living in a house of cedar, while the ark of God remains in a tent.” A prophet called Nathan replied to the king, “Whatever you have in mind, go ahead and do it, for the Lord is with you.” That night, the LORD appears to Nathan and asks him to go back to David and disappoint him. Fascinating! Check out the full story here. 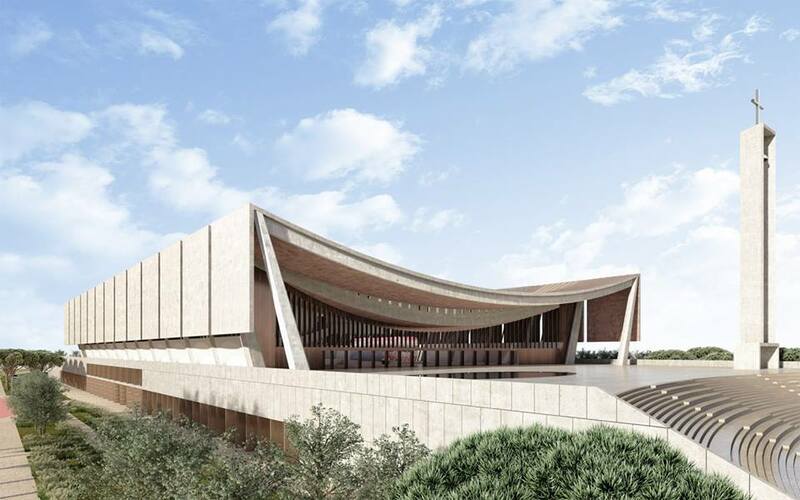 A national cathedral for Ghana may be a good thing, but depending on whether it is God’s will, especially vis-à-vis his timing, it may not be a pleasing and perfect thing in his sight. David rescinded; but provided all the resources for the one appointed and anointed to build that national cathedral to do so at the future perfect time—his heir and son, Solomon. For Christians, the question to ask is if such a national cathedral in Ghana will bring glory to God at this time, be a blessing to people at all times and in any way deal another punch to evil to make the righteousness, love, joy, peace, and power of God’s kingdom more established on earth as it is for all time and all eternity in heaven. Will other nations travel from near and far to come and see this edifice and leave breathless in wonder—like the Queen of Sheba when he visited Solomon and his national citadel—that the God of Ghana is great and most greatly to be praised? At the same time, will the beauty and glory of our everyday lives (not just when we’re suited up for church but at Makola and the government ministries) match the magnificence of this national cathedral? As for where to site it as well as the maintenance culture and costs, that is another conversation. *Bediako, Kwame. 2014. Christianity in Africa: The renewal of a Non-Western Religion. Akropong-Akuapem. Regnum Africa.